Access: Follow the Lake Minnewanka Road from the Trans-Canada Highway 1.0 km (0.6 mi) to the Lake Minnewanka-Johnson Lake road split. Turn right and continue 3.7 km (2.3 mi) to where the Johnson Lake side road. The Johnson Lake parking lot and picnic area are reached in 2.3 km. Maps: Canmore 82 O/3; Banff Up-Close (Gem Trek.). Check trail conditions before you go. Due to its low elevation, the trail around Johnson Lake is a fine walk in the early season (the trail is often snowfree by late April). 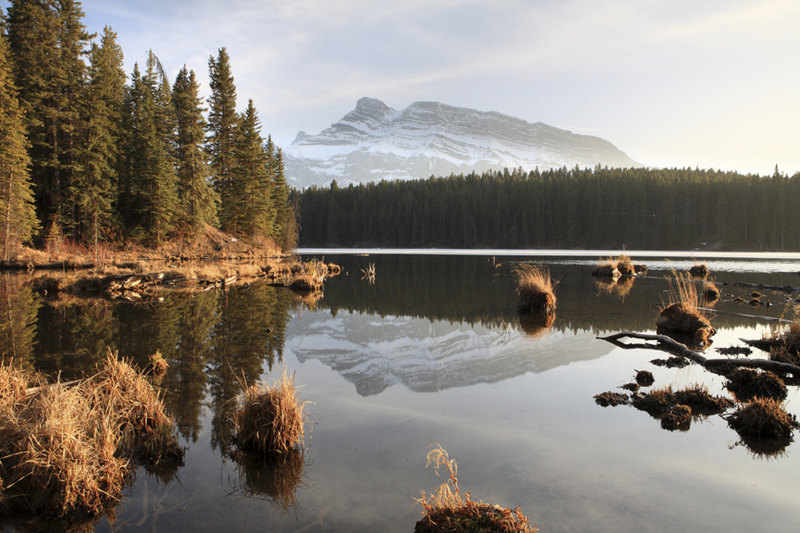 There is a lot of variety in the montane forest of the lower Bow Valley, and this short trail samples much of it, as well as a couple of marshy areas where waterfowl and muskrat are sometimes seen. By hiking around the lake counterclockwise, you will enjoy continuous views of Cascade Mountain on the return along the sparsely forested north shore. From the picnic area parking lot, walk downhill and across a small earth-fill dam and bridge. Beyond the bridge the trail angles uphill briefly beneath a powerline, then branches left into the forest where it rolls along through a dense forest of pine and spruce above the lake's south shore. In May, the forest floor is alive with the blooms purple calypso orchids. At the far end of the lake, the trail crosses an earthen dike, where you get your first good views down the length of this peaceful lake to Cascade Mountain. Returning along the north shore, there are grassy slopes and an open forest of Douglas fir and low growing junipers. The trail returns to the picnic area after a short detour around a marshy bay created by a small tributary stream.